There’s no beach vacation like an Hawaiian beach vacation. We’re talking pristine beaches that back into jungle, fiery lava that crystallizes into black sand, sweeping landscapes atop jagged peaks, and, of course, the surf and shrimp-truck paradise that is the island of O’ahu. 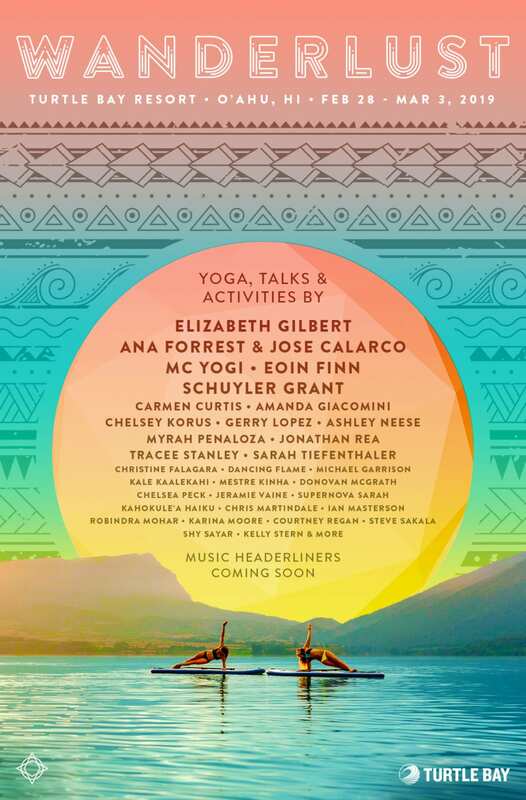 For one weekend every year, the North Shore turns into a wellness paradise too, as Wanderlust O’ahu takes over the famed Turtle Bay Resort. Joining us in O’ahu this year or considering it? * Read on for pro-tips to get ready. *You should absolutely gift yourself a Passport for the holidays! For little more than a ticket to a traditional 4-Day Festival, you can join us in O’ahu and every other Wanderlust event—worldwide—all year long. For more information, click here. We are pumped to announce that Hawaiian Airlines is offering 5% off roundtrip coach web fares on Hawaiian Airlines scheduled flights between JFK, SEA, PDX, SMF, SFO, OAK, SJC, LAX, SAN, PHX, LAS and Honolulu International Airport (HNL)—the closest airport to the festival. Forget pretzels: Experience Hawaiian hospitality with complimentary in-flight meals and snacks to stay nourished the whole trip. Wanderlust offers discounted lodging right on site at the beautiful Turtle Bay Resort. Let the waves guide you to sleep with a luxurious stay in one of the many room types available. These rates will expire on December 31, 2018. Not into luxury? Wanderlands Campgrounds is where it’s at. SUP and AiReal have traditionally been add-on activities for our traditional festivals, but for the first time in 2019, these activities are now included in the price of a regular ticket. Flip your perspective in an AiReal rig, or confront your fears of the unknown on a SUP board. These classes, as all classes, are first-come, first-serve. The sooner purchase your ticket, the more likely it is that you’ll get into one of the classes. Mana is a Hawaiian word for the power of elemental forces—the soul of the Earth that continues to propel our little rock forward in space. This year, Wanderlust is offering all new outdoor adventures that help you get out in nature in a big way. Our liberating trail runs, breathtaking oceanside meditations, peaceful sunset hikes, and exhilarating excursions will get you off your mat and into full adventure mode. If you’ve been to Wanderlust before, you know the Farm-to-Table dinner isn’t to be missed. O’ahu is no exception. But it’s not all fine dining: The Uncommons is particularly special in O’ahu, with ocean views and colorful flowers dotting the perimeter. Sang a fresh ahi poke bowl from the Kulima Market, and park it on the grass with new friends. While you’re at it, browse the goods in the Market, and go home with a mindfully-sourced memento of your time. Wanderlust’s Silent Disco has a reputation as being the best in the world—and it all started at Wanderlust O’ahu 2017. Dance to the beat of your fave DJ, or sample all three dueling DJs and discover a new style. Want to listen instead of dance? Don’t miss chart-topping musicians Bob Moses and Corinne Bailey Rae on the mainstage, and local acts like Ron Artis II and Mike Love. No matter what your true north is, let Wanderlust O’ahu be your first step to finding it. Prices rise for O’ahu tickets on Tuesday, February 5—be sure to snag the best deal before then. See you on the North Shore!